The Divers Institute of Technology (DIT) offers a commercial diving program that includes a comprehensive offshore training course. This training can prepare divers for the unique set of challenges that divers face when working on one of these giant oil rigs far out in the ocean. The largest oil rigs are literally floating cities, bigger than 1 or 2 football fields. Rigs are often located hundreds of miles offshore and crammed with thousands of workers at any one time. This makes even the most basic everyday tasks a real challenge for anyone who has not experienced such conditions before. In fact, conditions are more comparable with working on an aircraft carrier or a submarine than any onshore environment. Living conditions are extremely cramped, all the equipment needed for any possible eventuality must be stored on the rig. In the case of an emergency, help is quite far away, so the fastest transport is often by helicopter. So why do we spend so much time and resources constructing these megastructures deep out in the ocean? Oil rigs allow us to tap into the vast offshore reservoirs of oil and gas that power our entire world economy. Floating rigs are a cost-effective way to do this. Despite the immense dangers of working hundreds of miles out to sea in unpredictable weather conditions, offshore oil rigs have opened up billions of barrels of oil reserves that couldn’t be tapped before. Working on offshore rigs presents a whole set of new challenges such as working outside in 100-mile hour winds. For this reason, operating and maintaining the equipment that these rigs rely on requires a specialized skill set. Imagine trying to fix drill that extends for thousands of feet below the ocean surface. Or welding a pipeline set to transport millions of barrels of oil each day. Now imagine trying to accomplish these tasks far out to sea where visibility and currents make conditions a nightmare. First-time arrivals to any offshore rig usually find themselves overcome by the sheer size of the equipment. Everything from the drill piece to the huge cranes that tower over the rig like some great hand of God makes most new arrivals stop and wonder how such things are built. The underwater side of a rig is equally daunting. Massive pipelines that are used to transport the oil and gas securely from the well to storage facilities can stretch for hundreds of miles. These almost unbelievable feats of human construction that transport tens of of millions of oil barrels daily rely on commercial divers to setup and maintain. Unlike rig construction, this cannot be done on land. DIT’s own role in riser clamp training shows just how important a role this single piece of equipment plays in securing these pipelines. Without highly trained commercial divers, such equipment simply cannot be setup reliably, which is why ensuring commercial divers are trained to the highest possible level is all-important. Even though commercial divers spend a majority of their working time on these rigs maintaining pipelines and their clamps, there are lots of other jobs they need to do. Pretty much all parts of the underwater rig require divers help to keep them safe and running. Any rig, be it land-based or offshore, comprises of a total of 28 core components. 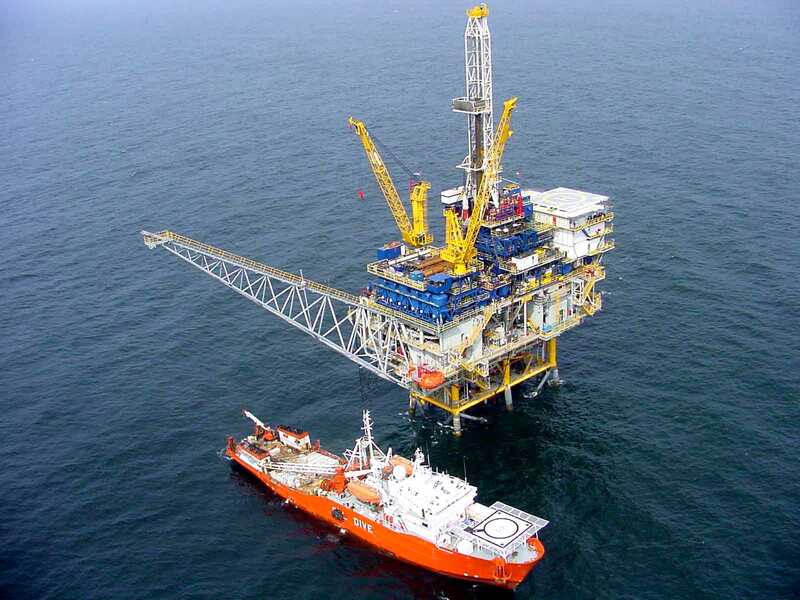 Offshore rigs have even more as they also require a semi-submersible platform that to keep the rig afloat. This platform must be kept in place either be being tethered to the seabed or by “Dynamic positioning” in deep water. These systems require drivers to work with heavy underwater cables and propulsion systems, something which would be a real challenge even if they were above ground. Even the task of simple underwater water inspection can be very difficult when the weather turns bad. Since commercial divers already find themselves working in a hostile environment that few people would even dare to go, training can be the difference between success and failure, and even life and death. Every process on an offshore rig needs to run smoothly. Each day that a rig is offline costs companies tens of thousands of dollars, so companies demand exceptionally high standards of work. A single failure of a piece of rig equipment or a weld, for example, can lead to much more costly environmental or human catastrophes too. Believe it or not, but the failure of a single piece of safety equipment actually resulted in the complete destruction of the Deep Water Horizon rig as well causing the ensuring environmental catastrophe in the Gulf of Mexico back in 2014. This is exactly why it is so important that divers undertake thorough courses in the skills that they will need to be a commercial diver. DIT’s Offshore & Hazmat and Underwater Welding courses represent two examples of essential training in the use of equipment that all commercial should have thoroughly mastered before they set foot on any offshore rig.